"Toronto’s Gord Peteran has launched a boarder-crossing career, opening up the category of furniture to an unprecedented range of psychological and conceptual content. Peteran usually starts with a found object: a rickety ladder-back chair, scrap wood from a dumpster, a pencil, or a heap of twigs. He will take one of these things and operate on it in some way, creating an artwork while leaving the thing itself more or less intact. In this way, Peteran has taken the category of furniture as a found object in its own right, a thing to be operated on conceptually. At Peteran's hands furniture dies a fascinating death, without ever quite going away." "Witty, wicked, often downright pixilated acts of furniture making…virtuoso manifestations.Peteran has gone very far beyond the confines of craft, visiting upon his work a formal, procedural force that invariably lifts his projects and objects into the realm of high art. Each of his exquisite and commanding pieces does precisely what he intends it should do—to operate in what he thinks of as the gap between us and our architecture." "Bad-boy genius…. His shop skills are impeccable, his imagination unlimited….Peteran has a dark sense of humour, a ribald wit and a flair for social satire." 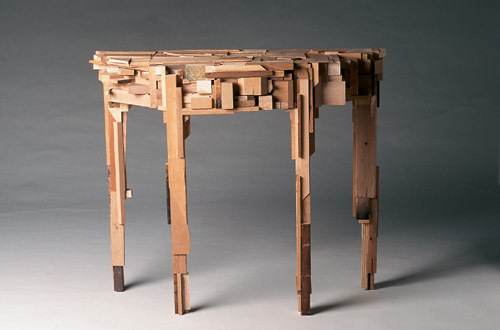 Peteran’s work pays homage to the traditional role of furniture while at the same time standing it on its head. It is furniture unlike any other. A table that doesn’t hold objects, chairs not made for sitting, objects that appear to function as torture devices or for the sexually experimental. Death is a common, if subtle, undercurrent in many of his works. 100 is a pair of precisely machined tables, one of which disassembles into a carrying case like that used for a rifle. Ark has the qualities of both a confessional booth and an electric chair. Untitled So Far appears as a shrouded or mummified corpse." "Technically impressive and often conceptually intriguing. A kind of philosopher of furniture. Mr. Peteran is a consummate technician, and his play with elements of furniture is often amusing and sometimes conceptually provocative." Calls Peteran’s ARK, a beautiful and beguiling work. Compares him to Meret Oppenheim, Hans Bellmer and Kurt Schwitters. His work shuns decorum for provocation. "In Gord Peteran’s workshop, mute household objects are made to spill their secrets as they evolve into something else. A fine cabinetmaker as well as a conceptual artist, Peteran is the Dr. Frankenstein of furniture. In his wickedly subversive hands, a chair, a clock, a table , are re-imagined into intriguing evocations of their former selves."